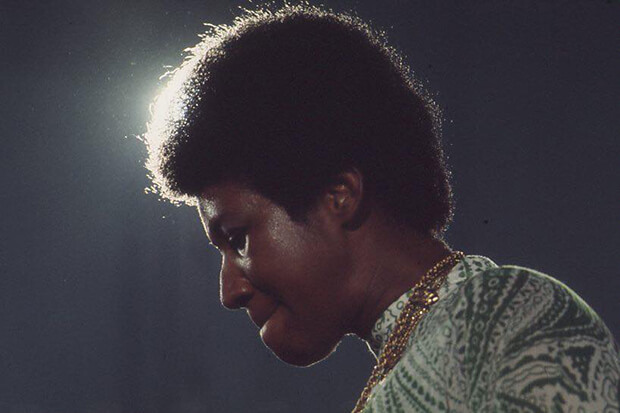 It took 47 years, technological innovation and a couple of court cases to bring Amazing Grace to theaters, but those struggles pale in comparison to the payoff. The fabled footage gives the viewer a front-row seat at one of Aretha Franklin’s most iconic performances. The Queen of Soul’s voice remained unsurpassed until the very end, but the chance to witness a young, transcendent Aretha at the very height of her powers is a gift. Both for long-time fans and younger audiences, who mostly know the superstar from Twitter memes. For them, this is an essential 87-minute history lesson. Filmed in 1972 at the New Temple Missionary Baptist Church in Los Angeles, Amazing Grace was supposed to be released along with a two-disc live album. Things went according to plan with the Grammy-winning recording (it remains the highest-selling live gospel album of all time), but the film never saw the light of day. Maddeningly, director Sydney Pollack and his team forgot to use a clapboard to sync the footage with the audio, which rendered it impossible to cut. And by the time technology had caught up, Aretha fought to have the documentary canned. The R&B icon never explained her dissatisfaction with the finished product, at least publicly. She couldn’t have been displeased with her vocal performance, which is otherworldly, or the way in which she is portrayed. (The then 29-year-old exudes humility, whether she’s putting on her own makeup in a dingy room or talking with the band). Perhaps, it was just too painful a trip down memory lane to take. After all, this is every bit as much as a love letter to Aretha’s faith as it is to her family. Seeing her father’s sheer pride, as he introduces his daughter to the congregation, is one of the film’s many highlights. As personal as the film is, it’s also a time capsule of the early ’70s. In some ways, this is more historical document than concert documentary. It captures not only the amazing fashion and hairstyles of a bygone era, but also how far we have come (or regressed depending on your position) musically. Everyone on screen, from the church choir to the band members, was at the very top of their game. No notes were missed, no bells and whistles were need to keep everyone (including Mick Jagger) riveted to their church pew. And then there’s Aretha. Luminous, composed and pious. When she stands behind the microphone, the God-given gift comes pouring out in a way that is as touching as it mind-blowing. While her legendary rendition of “Amazing Grace” is a highlight, every song stirs the emotions regardless of your faith or interest in gospel. Initially, I thought that the film would have benefited from more context — perhaps an interview with Aretha or someone at her label — but ultimately, it’s just you and Aretha. And surely that’s enough for any music lover. Amazing Grace is in theaters now. Find a showing near you here and watch the trailer below.